For homeowners seeking year-round protection, our PROActiv Pest plan is the most comprehensive and cost-effective approach to maintain a pest free environment in your home or business. Our PROActiv Pest Plan covers a wide array of insects that infest the typical structure. These include; Ants, Crickets, Centipedes, Millipedes, Pillbugs, Spiders, Springtails, Mice, Rats, and more. Our PROActiv Pest Plan provides 4 proactive treatments annually, which are designed to eliminate existing pests and maintain a protective barrier around the home to keep insects and rodents from re-infesting your home. Why Do We Treat 4 Times Per Year? Many customers ask why we do a winter treatment. This is due to the fact that our winters here do not sustain temperatures cold enough to prevent insect activity and movement. Often in the middle of January and February temperatures will rise into the 50′s or higher. When this happens, insects become active and may begin to re-infest the structure. Performing this winter treatment maintains your protective barrier and helps keep you pest free. We target your crawlspace with specialized preventative applications, proactively bait for rodents and perform a visual crawlspace inspection. If you have a re-infestation, we will come out that day, the next day or when it is convenient for you – at no additional cost as many times it takes. On-going Training to apply the right product in the right place. Treat your home like we treat ours. Occasionally a homeowner expresses concerns regarding the methods or products that we will be using. Please feel free to ask your technician any questions pertaining to the safety of our treatments. We strive to use environmentally sound practices to safeguard you, your family and pets. 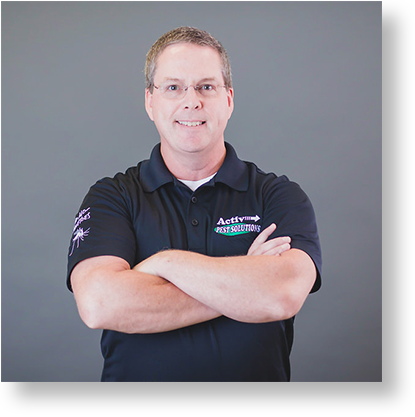 Activ Pest Solutions employees all have families and pets of their own and we will always hold your family’s safety in the highest regard, as we would our own. We apply a wide array of products for different needs. Many of these products are actually natural, non-chemical compounds and many have the same warning label as your bottle of household cleaner at home. Is to apply a minimal amount of product inside the home by targeting specific areas where a problem occurs. Once a situation is under control we will maintain it with our PROActiv Pest Plan exterior treatments, only coming inside if or as needed and requested by you. Please feel free to advise us of any special needs you may have. Many exterminating or pest control companies will give you a price over the phone to “spray” your home in hopes of getting rid of those pesky little ants without a thorough on-site inspection and species identification by a certified pest control technician. A price quote over the phone to “spray” for ants which have not been identified nor the conducive conditions contributing to the infestation, is just bad and can be a disservice by making the infestation WORSE. Different ant species and conditions require different techniques and treatments. If an exterminating or pest control company does not value your home enough to perform a complete and thorough inspection, I would be suspect of the value of their service. Always the fastest response time in the Industry. It is our policy to provide each customer with a FREE ON-SITE THOROUGH INSPECTION by a Full Time Certified Pest Control Professional Technician. We will identify the insect species, note any conducive conditions that may contribute to an infestation and provide you with a solution to rid your home of pests and keep them from coming back.